Follow the Large Arrows where East Chang'An Avenue and the (Former) West Legation Street lead away from TiananMen Square into the Former (Boxer War) Legation Street and Area. Below on this Map south Great Hall of the Peoples street and West Chang An Avenue lead away to The National Theatre Dome. 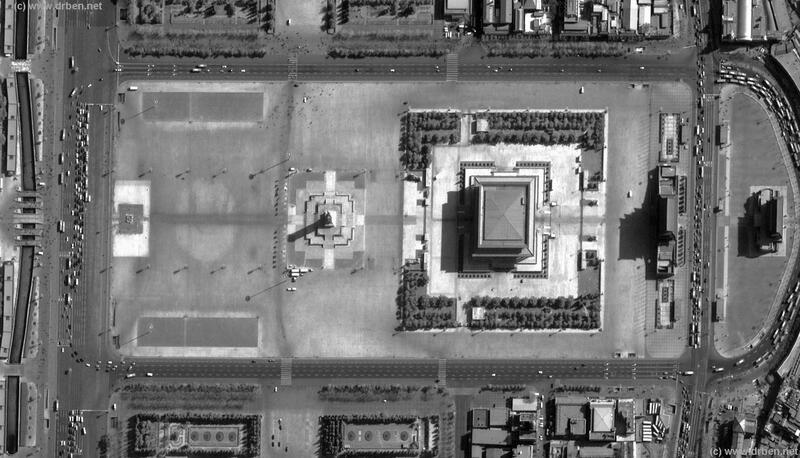 The below Satellite Image of Tian an Men Square, or The Square of Heavenly Peace, clearly shows the TiananMen Square and all structures on it. These are from South to North - 1) Qianmen ( The South Gate ) , 2) ShenyangMen ( Arrow Tower ) , 3) Chairman Mao Zedong Mausoleum , 4) The Monument to the Heroes of The Revolution , 5) the National Flag Stand and Finally at the North Side of TiananMen Square, 6) Tianan Men ( Gate of Heavenly Peace ). Parts of surrounding Landmarks & Monuments such as The Great Hall of the Peoples and the opposite Museum of the Revolution and Chinese History (recently renamed National Museum of China) are also visible. Mouse over Image to reveal Names and Positions of all landmarks & monuments. 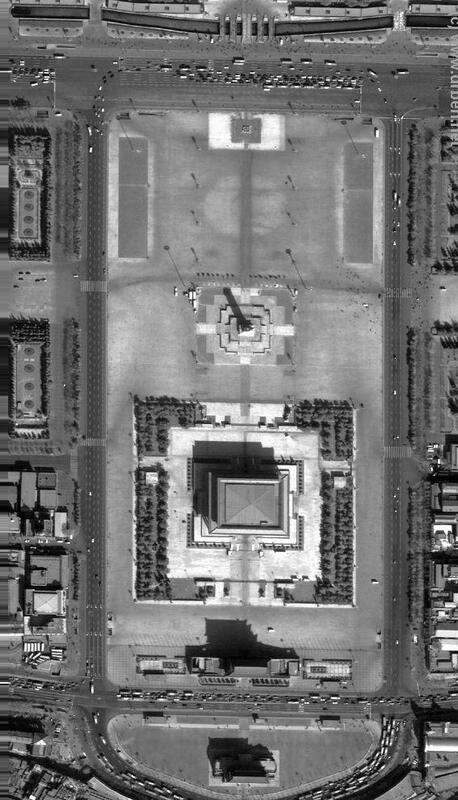 Beijing Report photographed Monuments are highlighted by a Red Dot with corresponding link that leads to the appropriate Virtual Tour Page and lots of Photos and info on your monument of Choosing. Not on this Map ! : Tianan Men ( Gate of Heavenly Peace), only the 5 bridges leading up to the Gate are visible. The Same goes for The Great Hall of the Peoples of which the front Gardens at TiananMen Square are visible and The Museum of the Revolution of which only the front park and stairs can be recognized. Dwell into (Former) Hutong Lanes of QianMen-Chongwen Area. To (Former) Hutong Lanes of Xuanwu-Dashilan - Liu Lichang Area. To Great Hall of the Peoples West Street (Renmin Dahui Tang Xi Lu) and the National Theatre.